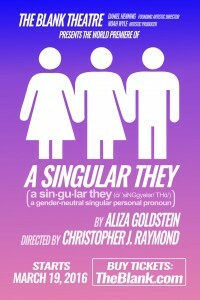 The cast and designers have been set for The Blank Theatre’s world premiere production of A Singular They by Aliza Goldstein, directed by Christopher J. Raymond. Performances begin March 19 with opening night set for Saturday, March 26. In alphabetical order, the cast will feature Wes McGee, Lily Nicksay, and Hannah Prichard. The design team includes Aaron Lyons (set), Donny Jackson (lighting), Allison Dillard (costumes), and Rebecca Kessin (sound). Nic Dressel is the stage manager. Producers are Daniel Henning, Noah Wyle, and Sarah A. Bauer. The opening of A Singular They will mark The Blank Theatre’s 20th anniversary at the 2nd Stage Theatre on Hollywood Theatre Row. The Blank took up residence in March of 1996 and in April of that year the LA premiere of Breaking the Code starring Dennis Christopher was a sold-out hit winning LA Drama Critics Circle, LA Weekly, and Drama Logue Awards and two Ovation Award nominations. Since that time, The Blank has produced multiple award­-winning productions at the 2nd Stage, including David & Amy Sedaris’s The Book of Liz, and most recently the critically acclaimed Sons of the Prophet by Pulitzer Prize finalist Stephen Karam. The Blank Theatre is committed to developing new plays and new artists. The Blank’s mainstage production of A Singular They is the culmination of its new play development program. This play was first presented in The Blank’s Living Room Series, a staged reading series of new plays. It was then produced in the new Living Room Series Plus, a process which takes a play further into development with more rehearsal time and a few performances in front of an audience. Author Aliza Goldstein, who makes her professional debut with this production, was a four-­time winner in The Blank’s Nationwide Young Playwrights Festival, having her first play produced in the YPF at age 15. Aliza Goldstein is a playwright and video game writer based in Orange County, CA. Her work has been produced at theatres across the country including the Kennedy Center in Washington, DC. She is a two-time finalist in the International Thespian Society’s Playworks Program (2008, 2009), a four-time winner in The Blank Theatre’s Young Playwrights Festival (2008, 2009, 2010, 2011), and a 2009 finalist in the Young Playwrights Inc. National Playwriting Competition. Goldstein is also the recipient of the 2007 VSA Playwright Discovery Award, the 2013 John Golden Prize for Undergraduate Playwriting, and the 2015 Ebell of Los Angeles Playwright Prize. Director Christopher J. Raymond is a graduate fellow of the American Film Institute and currently serves on The Blank’s Living Room Series Artistic Committee. He directed the world premiere of Michael Shaw Fisher’s rock opera Doomsday Cabaret at the 2015 Hollywood Fringe Festival. 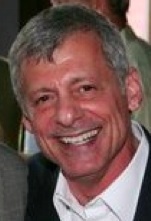 In addition, he has directed numerous plays for the Living Room Series and the Young Playwrights Festival. He is currently in development for his directorial feature film debut of his adaptation of D.M. Thomas’ novel Flying Into Love. His award-winning screenplay and finalist for the Nicholls Fellowship, Daughter of Heaven, is also in development. Preview performances of A Singular They begin on Saturday, March 19 at 8pm and continue on Sunday, March 20 at 2pm, and Tuesday through Friday, March 22—25 at 8pm. Opening is set for Saturday, March 26 at 8pm. The regular performance schedule will be Friday and Saturday at 8pm and Sunday at 2pm through May 1. Tickets are $25 for previews and $30 for regular performances and may be purchased online at www.TheBlank.com or via phone at (323) 661-9827. The Blank’s 2nd Stage Theatre is located at 6500 Santa Monica Boulevard (on Theatre Row at Wilcox), in Hollywood, 90038. Moth Theatre has announced the first production of its 2016 season, Mine by Ryan Surratt. Presented in association with Rydemption Entertainment and directed by Justin Huen, Mine will play one preview performance on March 10 and opening is set for Friday, March 11 at 8pm. The run will continue through April 16. The cast will feature (in alphabetical order) James Oliver, Nicole Steinwedell, and Ryan Surratt. Production design is by Justin Huen and Ryan Surratt and the stage manager is Lauren Kelly. Mine is the tale of two childhood friends who are forced to traverse the minefield of their relationship after a dangerous incident occurs. Run time is 70 minutes. Ryan Surratt (Playwright) graduated from USC with degrees in Business and Film. Mine is the first play he has written for the stage. His film Fatherland is currently in pre-production. As an actor, Surratt’s stage credits include Glengarry Glen Ross, Extremities, Reasons To Be Pretty, The Crucible, Speed the Plow, and many others. Among his TV and film credits are MGM’s remake of Fame and Sony’s The Ugly Truth; CSI Cyber, Mistresses, and more. Justin Huen (Director) is a multi-award-nominated actor/director/designer who has worked in intimate and regional theatres across the country. His work as a director has been seen in critically acclaimed productions including Their Eyes Saw Rain, Money Shot, and Dawgs. As an actor, Huen was recently seen in the Getty Villa production of Mojada. In January 2015, his set and lighting design work were featured in the Ovation Award-nominated production of Proof at Moth Theatre. Mine is set to open on Friday, March 11 at 8pm. The regular performance schedule is Thursday, Friday, and Saturday at 8pm through April 16 only. Admission is $25 and tickets may be purchased online at picatic.com/mine or by phone at (213) 249-2062.